When liberal lawmakers and low-income advocates exited the House chamber last January after Gov. 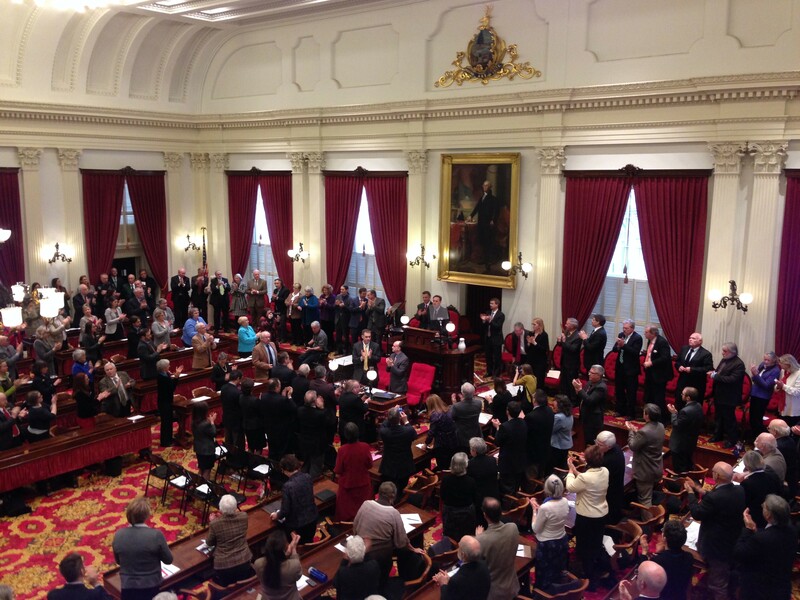 Peter Shumlin's 2013 budget address, they were downright apoplectic. Summoning the spirit — or at least the rhetoric — of Ronald Reagan, Shumlin vowed to take on the so-called welfare state. He proposed capping Reach Up benefits for needy families and diverting a portion of the Earned Income Tax Credit to fund other priorities. The Democrat-dominated legislature quickly rebelled, and many of Shumlin's proposals died a slow death. This year, Shumlin sang a different tune. Not far into the governor's 2014 budget address, which he delivered Wednesday afternoon to the Vermont House and Senate, Shumlin called on legislators to spend $4.3 million more next year to "move Vermonters out of poverty." "In these challenging times, as the federal government continues to make shortsighted cuts that hurt our most vulnerable, our state must do what we can to blunt the damage by allocating our limited resources wisely," he said. To that end, Shumlin proposed doubling the state's investment in rental subsidies and increasing funding for homeless shelters and child-care centers. Notably, he pitched spending $650,000 more on substance abuse and mental health treatment for Reach Up recipients. It was as if he was pushing the reset button. "This is a big step forward. I mean, this is a really important, renewed commitment to poverty reduction in the state of Vermont," said Vermont Legal Aid staff attorney Christopher Curtis, an outspoken opponent of Shumlin's 2013 agenda. "This is a major departure from last year. It's a real improvement. And it's a huge step in the right direction." Far less memorable than last year's budget address or last week's opiate-focused State of the State, Wednesday's speech appeared designed to avoid offense. In the weeks before he delivered it, Shumlin had promised legislators that, unlike last year, there would be no surprises. And, for the most part, there weren't. In presenting his $5.6 billion budget, Shumlin, for the thousandth time, said he would reject "broad-based tax increases on hard-working Vermonters." To close a projected $71 million gap between revenues and spending, he proposed relying upon just $30 million in one-time funding sources, compared with $51 million last year. Those include an $8.3 million settlement with R.J. Reynolds Tobacco Company and a $5 million payment from Entergy, part of an agreement to decommission the Vermont Yankee nuclear power plant. The governor's budget also relies on $29 million in increased "special and federals funds" and a $14 million tax on health insurance claims. Shumlin dusted off a few proposals he pitched last year — such as universal pre-kindergarten and a free year of tuition to those pursuing science, technology, engineering and mathematics training at state colleges and the University of Vermont — urging legislators to "get that done." Citing the ever-rising statewide property tax, Shumlin called on lawmakers to "explore any options" that might slow the growth of education spending. Noting Burlington's tech successes, he said he'd work with the legislature to "encourage and grow technology development." And arguing that "water quality problems... have for too long plagued our state and fouled our lakes," he said he was working to find "common-sense solutions" to the problem. But in all three cases, Shumlin declined to offer specific plans. By the time the speech was over, it was difficult to recall a single bold proposal. After avoiding the fraught topic of health care reform in last week's State of the State, Shumlin finally acknowledged the elephant in the room. Noting that there has been "a lot of focus on the troubled roll-out of the federally-mandated exchange," the governor essentially apologized for the months-long technological meltdown at Vermont Health Connect. "I am extraordinarily disappointed and I take responsibility for it," he said, before quickly segueing to his single-payer dreams. "But the difficult roll-out of the exchanges here and across America should remind us once again that we need, we deserve and we can have simple, universal, affordable, comprehensive health care for all, where costs are sustained and access to quality care is guaranteed just because you're a Vermonter." That wasn't quite enough for Senate Minority Leader Joe Benning (R-Caledonia), who said that, when it came to Shumlin's remarks on providing universal health care, he heard "nothing more than campaign rhetoric." "Vermonters have a right to know," Benning said. "This is not a nothing-burger. Simply put, where is the beef? How much is it going to cost? Who's going to pay for it? And how are we going to pay for it? Those issues remain unstated." Despite devoting nearly all of last week's State of the State address to what he called an opiate "crisis" plaguing Vermont, Shumlin uttered just two sentences on the topic this week, providing no new details. "I have also included in this budget new funding to support the ambitious drug abuse prevention and treatment agenda I laid out for you last week," he said. "This new funding will mean a 14 percent increase in prevention services and a nearly 40 percent increase in treatment services for those who are suffering from addiction."